Four strikes! That’s all it took for our champion to drive home a two and a half-inch oval nail and to win a bottle of wine in one of our open day activities. Four years! That’s how long we’ve been doing the Barnaby carnival parade and that’s where it all started. A parade needs floats and floats need a place to be built. 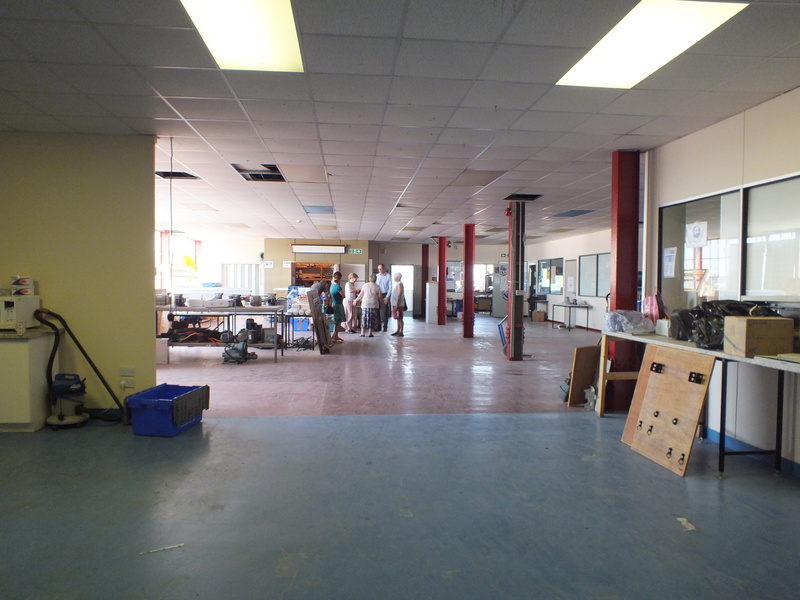 For the last four years we have had to borrow a space to work – people have been generous – but borrowed space means borrowed time and it also means – get out when the carnival is over. 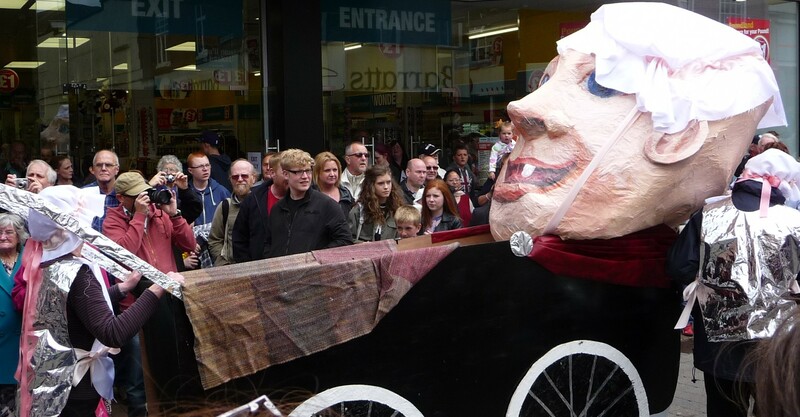 Building an over sized baby pram with grinning toothy papier-mache baby is fun, breaking it up and putting it in the bin feels like a criminal offence! After four years of temporary, sometimes damp, sometimes cold, and sometimes, “Do you think you could move somewhere else because things have changed since we loaned you the space”, we needed a place of our own. Together with the clarion call; “This is great, wouldn’t it be wonderful if we could do arty stuff all the year round”, a place of our own became the driver to form a new organisation, a community arts charity for Macclesfield people to enjoy. You don’t want to hear about the boring stuff but IT TAKES AN AGE to get things sorted, registration, trustees, objects, more registration and so on. Then there’s the grant applications – “We just want to do good – to help people have a better life – we don’t want to be paid, we’ll give our time for nothing, we don’t really need much for materials because one of our aims is to re-cycle old stuff – yeah looking after the planet and all that – just give us some money to rent a space so that people can do interesting and creative art stuff – that’s all we want”. So thanks to the Big Lottery we’ve finally got a space (for a few months at least) and a great one at that, up on the top floor of an old paper mill in Heapy Street. It’s fab. Lots of light and room to store materials; it has great view over Macclesfield town on one side and on the other glimpses of the Hollins. It’s warm in the summer and…. ‘stimulating’..in the winter. Good for different types of activity too – a large space for building things like parade floats – a craft room also good for drawing and painting groups, a sewing room with dead posh sewing machines and a loom. Yes that’s right, a loom! And something we dreamed of, a cafe area, well you must have tea (and cake) whatever you are doing. In fact cake features quite a lot in most things that happen at ArtSpace. 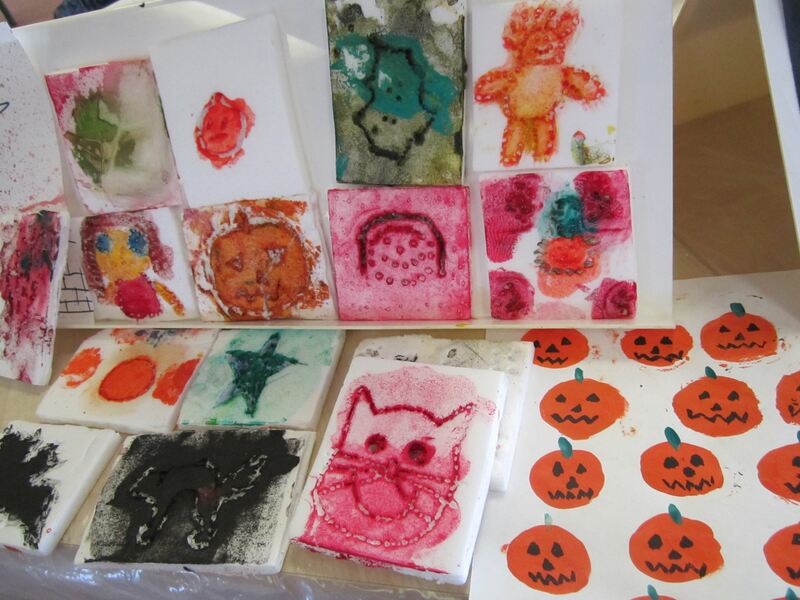 Our basic idea is to provide a space, materials and equipment that people can use to do arts activities. You don’t have to be an arty type, in fact we want to encourage everyone to have a go. (Arts professionals are welcome too). We have a programme of activities that you can join in or if you prefer you can do your own thing. Talk to us about projects that you want to do and we’ll do all that we can to support you to make it happen. That’s enough of the advertising now back to the story. Lots of lovely people have donated furniture and a national company, Kingston Smith & Co., sent its whole staff team from its local office for a day to help us get the place ready for use. We have a Forum, which is open to everyone to come up with ideas about arts projects and to guide us about how best to run the place, and we have a board of Trustees to make sure everything is operating safely and legally. In between we have a Steering Group who sort out the day-to-day organisational stuff. We are about half way through a four-month Lottery project that has helped to get us started. Called ‘Space Fall’, the project is open on several days each week for people to join in lots of different arts projects including the creation of banners, craft workshops, and a sewing fanatics group. We are starting to build floats for the 2014 Barnaby Carnival Parade and this years theme is Industry – from steam to steam punk! We’re having parade sections to reflect the traditional, the fantasy and the bizarre with floats, giant puppets, musicians and hundreds of people in costume. New projects coming up include Pop up exhibitions by local artists, presentations and try-out sessions in different art forms – with ideas springing up all of the time there’s always something new going on. So there’s lots going on and it’s only the beginning, lots more to do, to see, to create & to be part of. Love it. – .and can we use it for a publicity shot?